How can I get my FLIR A310 camera to work with my Network Video Recorder (NVR)? 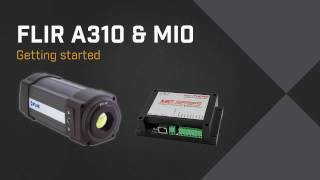 How do I get started with the FLIR A310? What is the digital I/O connector intended for, and how does it work? How do I work with alarms on the FLIR A310 using the digital output and input? If I have an e-mail server (e.g., Mircrosoft Outlook), how do I set up my camera to store images on this server when an alarm goes off?